Item # 309711 Stash Points: 1,595 (?) This is the number of points you get in The Zumiez Stash for purchasing this item. Stash points are redeemable for exclusive rewards only available to Zumiez Stash members. To redeem your points check out the rewards catalog on thestash.zumiez.com. Highlight your look with the eye-catching Plantlife Deep Jungle Tie Dye Crew Socks from HUF. Designed with hues of blue, teal and white throughout, these weed leaf printed crew length socks provide any look a striking aesthetic. 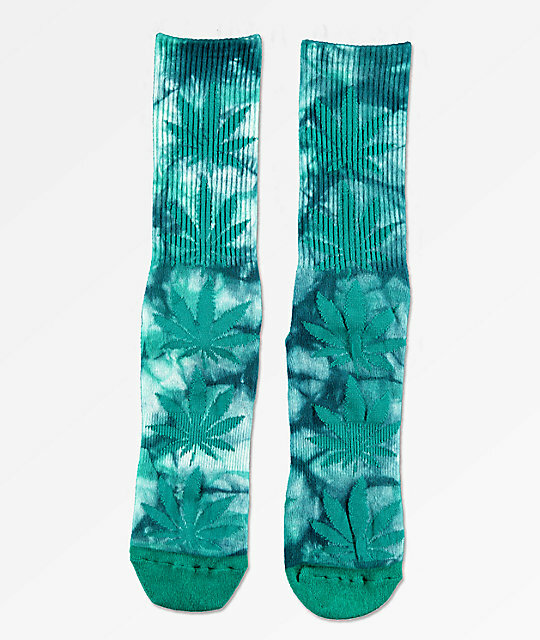 Plantlife Deep Jungle Tie Dye Crew Socks from HUF. Blue, teal and white tie dye construction throughout. Jacquard knit teal weed leaf pattern throughout.